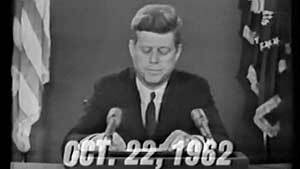 — John F. Kennedy, address to the nation, June 1963 after the Cuban Missile Crisis. THIRTEEN DAYS is the taut story behind the maddening politics of the John F. Kennedy administration during the Cuban Missile Crisis of October 1962, when the world held its breath as Russia moved nukes into Cuba and America played chicken with them. 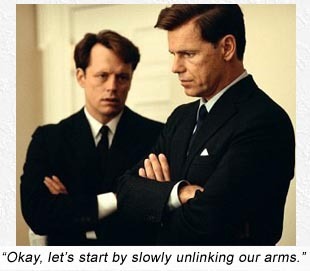 From the book by Philip D. Zelikow and Ernest R. May, The Kennedy Tapes – Inside the White House During the Cuban Missile Crisis, director Roger Donaldson and screenwriter David Self capture every sweat-soaked moment of the Machiavellian politics yet keep it understandable, airtight and kinetic, with the filmstock often reverting to black and white to emulate the iconic period look. Kevin Costner is presidential advisor Kenny O’Donnell, whose Kennedy-clique accent at first seems over the top, but when everyone is vocalizing at that level of absurdity we’re soon inured to it. In a time when all women wore beehives and men folded their arms across their chests more than they had to for maximum iconic photo effect, the thirteen day standoff finds President Kennedy battling against his own military who want to invade invade invade (the only solution those lunkheads know or understand), and against the Russian diplomats stonewalling him on the reason for the missiles. The inoperative missiles – when operative – would have the capacity to level American cities in minutes. How dare they?! Don’t the Russians know that only America is allowed to point missiles at other countries? With the aid of brother Bobby (Steven Culp) and back room deals with the Russians (that were not revealed until nearly three decades after the crisis), John F. reached a non-military resolution, saved face and became an American Hero. And all with that abominable accent. Writers: David Self, Philip D. Zelikow, Ernest R. May. Starring: Kevin Costner, Bruce Greenwood, Steven Culp, Lucinda Jenney, Stephanie Romanov, Dylan Baker, Bill Smitrovich, Henry Strozier, Michael Fairman, Tim Kelleher, James Karen, Peter White, Kevin Conway, Elya Baskin, Jack McGee, Christopher Lawford, Michael Gaston.